When I think of the Disney of my youth, I picture Mickey Mouse, Donald Duck, and Snow White and the Seven Dwarves. My how the brand has evolved—now it’s hard to think of an animated film that isn’t Disney. When my girls were younger, we couldn’t get enough of the Toy Story, Finding Nemo, and Monsters, Inc. movies (to name a few). And let’s not even get into the princess movies, I think there are too many to count, but you know what I’m talking about. In fact, I still love going to the theater to see all their new films—you’re never too old for Disney. That’s the magic of Walt Disney—old or young, there’s something for everyone. A land where toys come to life, ordinary girls and boys can become princesses and superheroes, and being good and kind always wins. I think this is something we can all get behind. With this Disney gift guide, you can bring a little bit of Disney magic into someone’s daily life (or even your own). Choose from items like a Mickey Mouse waffle iron, a mermaid tail blanket, or a Disney clock made from a vinyl record (yes, really!). 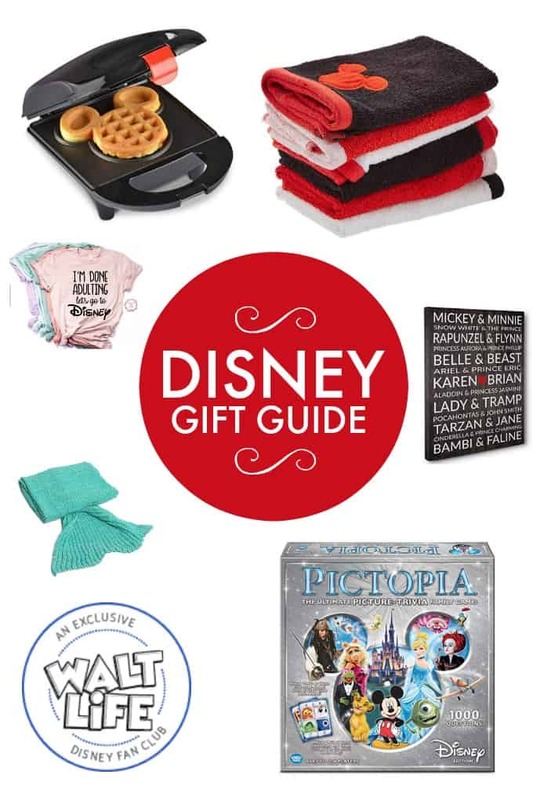 I hope this Disney gift guide makes shopping for those one-of-a-kind items that much easier. 1. Disney Crate. This subscription box from Cratejoy will wow even the most fickle Disney fan. Aptly titled the “Dreamers Box,” this monthly box is delivered right to your door and full of Disney-themed items and collectibles, made for Disney fans, by Disney fans. 2. Walt Life Subscription Box. When you order a Walt Life subscription box, you get to choose either a Disney Snack Box, a Magic Box, or a Magic Plus Box, all filled with Disney-themed items, such as food or collectibles. 3. Disney Logo Family Vacation T-shirt. If you are planning a family vacation to Disney, then this shirt is a must-have. Customize the shirt under the Disney logo to include your family name or individual names of those going on the trip. 4. Mickey Mini Waffle Maker. Why wake up to ordinary, boring waffles when you could have Mickey Mouse-shaped waffles? 5. Pictopia Family Trivia Game: Disney Edition. How well does your family know Disney? Put one another to the test with this trivia game featuring Disney characters. This game is a must-have for family game night. 6. Disney Decorative Bath Collection. Perfect for a child’s or guest bathroom (or anywhere you need a little Disney magic), these Disney bath accessories (towels, shower curtain, soap dispenser, and more) all feature Mickey Mouse designs. 7. Mermaid Tail Blanket. Perfect for adults and kids alike, this knit mermaid tail blanket comes in a variety of colors and keeps you nice and toasty and feeling a little bit like a real mermaid. 8. Disney Couples Personalized Wedding Gift Canvas Wrap. Any couple would love to see their names situated among some of the most famous couples in Disney history: Snow White and the Prince, Lady and Tramp, and Belle and Beast, to name a few. 9. Beauty and the Beast Bath Bomb Set. These bath bombs are perfect for your favorite Disney fan. The stress of the day will literally melt away while the scents of marjoram, lavender, orange, and chamomile fill the room. 10. Disney Vinyl Record Clock. What will they think of next? What a great, original gift for the Disney lover or vinyl collector in your life. This wall clock is crafted from used vinyl and features a working clock surrounded by a Walt Disney theme. 11. I’m Done Adulting T-Shirt. Unleash your inner child when you wear this “I’m Done Adulting, Let’s Go to Disney” t-shirt. Available in eight colors and five sizes, there’s sure to be one that’s perfect for the Disney lover in your life. 12. Disney Name Necklace. Now anyone can see their name coming up Disney. Using the Disney logo font, this 14K, yellow gold necklace can be customized to fit the name of any loved one. 13. Minnie Mouse Inspired Toms. Slip into these oh-so-comfy (and adorable) Toms shoes with hand-painted Minnie Mouse designs and bring a touch of Disney magic with you everywhere you go. For more gift guides, check out these best travel gifts, gifts for coffee lovers, and gifts for book lovers. What Disney gift is your favorite?